Signs and announcements are an aspect of language with their own fascination, providing a window into the mentality and customs of different cultures and societies. Familiar signs and announcements can become so woven into the texture of everyday life that they take on a life of their own. Here we look at how an announcement warning rail passengers to beware of the gap between the train and the platform is handled in four different languages. The constantly repeated mantra 'Mind the Gap' is a familiar fixture of the London Underground or 'Tube'. Originally a cautionary reminder of the hazardous gap created by curved platforms between trains and platforms, the expression has achieved almost iconic status. 'Mind the Gap' is now widely used in totally unrelated contexts, referring, for instance, to the socioeconomic gap between haves and have-nots or acting as a metaphor for the uniqueness of British life and culture. There are even artistic troupes known as 'Mind the Gap'. Speaking of the gap sounds self-explanatory but it is in fact quite unclear. 'The', known to grammarians as a definite article, is specifically used when the speaker assumes that the listener knows exactly which item he/she is referring to. In this case, the announcement assumes that the general public knows that the gap in question is that between the train and the platform and no other. Correct identification of the gap is dependent on context. The general context is that of stations of the London underground, more specifically that period of time when carriage doors are opened for passengers to board or alight, which is when the announcement is broadcast. Another important clue is the verb 'mind', which is used to exhort people to exercise care due to the existence of some physical obstacle or hazard. In other words, the announcement tells the public: 'there is a gap somewhere that you should be careful of as you get off the train'. In this context, 'Mind the Gap' is, almost miraculously, understood by native English speakers as it is supposed to be -- look out for the gap between the train and the platform. The people who thought it up obviously expected it to be understood, and while one wonders how justified this is (would, say, a bumpkin from the Alleghenies understand it instantly? ), English speakers do not find it strange or outlandish to be asked to mind an unspecified gap. The brevity of 'Mind the Gap' is in keeping with other signs in English like 'No loitering' or 'Keep out'. This is achieved by use of the smallest possible number of words. Brief is not necessarily rude. A straight command (the so-called 'imperative form') can often be used in English without sounding rude, which makes for a wonderful economy and brevity of expression. In this case, the imperative form of the verb 'mind' is perceived as a polite request to exercise care. So how could a simple expression like 'Mind the Gap' be handled differently in other languages and cultures? 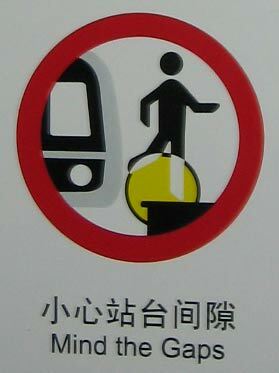 Like London, stations in Japan, Hong Kong, Singapore, Guangzhou (China), and Beijing (China) feature warnings to be careful of the gap between the platform and the train. Here is how Japanese and Chinese (Cantonese and Mandarin) station announcements tell their passengers to 'Mind the Gap'. Densha to hōmu to no aida ga hiroku aite orimasu no de, ashimoto ni go-chūi kudasai. ご注意 go-chūi 'care, attention'. Go, written ご or 御, is honorific. The noun is 注意 chūi, the verb is 注意する chūi suru 'to take care, pay attention'. ください (or 下さい) kudasai 'please'. Grammatically, this is the imperative form of the verb くださる 'to give (to me)'. By comparison with the short and snappy British version, the lumbering Japanese is far too specific to be anything other than utilitarian. It certainly doesn't look a likely candidate for iconic status. But this version of 'Mind the gap' is interesting as a fine illustration of the stereotyped and ubiquitous language of announcements that form part and parcel of life in Japan. Indeed, some Japanese buffs have even lovingly recorded train announcements and uploaded them to the Internet. 1. Unlike English, Japanese is clear and specific. As we saw above, the 'gap' in the English announcement is gloriously ill-defined. This would never do in Japanese, where a request to look out for an unspecified 'gap' would be greeted with total bewilderment. While often described as a vague language, Japanese in fact has exacting requirements on the wording of notices and announcements in order to ensure clarity. Obscure or vague wording can result in incomprehension and confusion. In this case, the Japanese is expected to spell out not only the exact location of the gap (between the platform and the train), but why this particular gap is a matter of concern -- it is a wide gap. By telling the passenger to watch his/her step, the announcement also specifies the general source of the danger and clarifies what should be done to avoid it. 2. Where English is abrupt, Japanese is careful and polite. 空いております aite orimasu. The plain everyday form that you would use with friends is 空いている aite iru ('it's open, it's separated'). In a public announcement, the polite -masu form of the verb must be used. In addition, this sentence substitutes the humble verb oru / orimasu for neutral iru / imasu. The effect is to add an extra layer of formality and politeness. ご注意ください go-chūi kudasai. This is the standard polite form of request for the verb 注意する chūi suru. It involves adding an honorific go in front of chūi ('care, attention'), followed up by a kudasai ('please'). The unadorned Japanese imperative of 注意する chūi suru is 注意しろ chūi shiro. This is a highly abrupt and impolite form used mainly by men in situations of great familiarity and/or clearly defined power relationships. Public use of the brusque imperative is appropriate only in very specific circumstances, e.g., at the scene of a fire, firemen dispense with politeness to yell 退け！ doke! ('out of the way!') as they run with their hoses through the milling bystanders. ので no de This is a polite conjunction meaning 'because' or 'as'. The Japanese feel that it is polite to give a reason for a request. Where English speakers may find it acceptable to ask people 'not to park on the footpath/sidewalk', in Japanese it's obligatory to add a reason, even if only the vague assertion that 'it inconveniences other people'. Thus, Japanese requests typically take the form of 'reason + no de + request'. One might wonder why the Japanese go to such lengths of politeness and solicitude for the well-being of the general public. To a large extent it is self-protection. Without the announcement, the railway company would be open to charges of negligence. And without the excruciatingly polite language, they would be accused of having a bad attitude. Variations: The above is a fairly standard form of the announcment. However, some variants can be found. To see variant versions, click here. Having considered the elaborate politeness of the Japanese version of 'Mind the Gap', let's see how the phrase is handled in Hong Kong. Thanks, one suspects, to British influence in both railway construction and concepts of public service, 'Mind the Gap' is alive and well in Hong Kong. Spoken announcements in Cantonese on the Hong Kong MTR use the following wording. 月台 jyt2-toi21 yuètái 'platform' -- used in Taiwan and Hong Kong. Mainland uses 站台 zhàntái in preference to 月台 yuètái. The Cantonese transliteration system used here is an indiosyncratic one that represents the aspiration/non-aspiration distinction with voiced/non-voiced consonants. Tones are represented by numbers indicating relative pitch, 5 being the highest pitch and 1 being lowest. Although spoken in Cantonese, grammatically this version conforms with standard Chinese (Mandarin) and makes perfect sense when read out in Mandarin. This is because written Chinese usually follows Mandarin grammar, not the grammar of Cantonese or other dialects. In Hongkong, vernacular Cantonese may be found in printed or written form only in certain circumstances, such as sections of the newspaper devoted to items of popular interest (gossip and interviews with show biz celebrities, etc.) and some advertising. On the Mainland, it is even rarer to find Cantonese in any kind of printed materials. The Cantonese version can be described as a happy medium between the terse British announcement and the verbose Japanese one. 請 tsing35 / qǐng is the Chinese equivalent of 'please'. It is a formal expression and makes the sentence polite because 請 in Chinese is used less than English 'please' in daily life. It is the standard expression used in public notices of this nature. The Hong Kong MTR also has a slightly longer version of the spoken announcement that specifies quite clearly that the gap is between the train and the platform. Tsing35 siu35-sam53 lit2-tse53 jy23 jyt2-toi21 gaan53 dzi53 hung53 -gwek5. Qǐng xiǎoxīn lièchē yǔ yuètái jiān zhī kòngxì. 月台 jyt2-toi21 yuètái 'platform' -- used in Taiwan and Hong Kong. The Mainland uses 站台 zhàntái in preference to 月台 yuètái. As in Japan, there are buffs who have collected train announcements for Hong Kong railways. This version simply commands 小心空隙 siu35-sam53 hung53-gwik5 (Mandarin: Xiǎoxīn kòngxì), literally 'Mind gap'. Singapore's MRT also has signs warning passengers to 'Mind the platform gap'. However, there are no announcements. As befits a multilingual city, the signs appear in four languages: English, Chinese, Malay, and Tamil. The following is the sign as it appears on the station doors that open onto the train doors. Qǐng zhùyì yuètái de kòngxì. The meaning and structure is the same as that of the Hong Kong MTR, although the verb 注意 is used instead of 小心 and a 的 inserted between 'platform' and 'gap'. Singapore uses Simplified Chinese characters, like the Mainland and unlike Hong Kong. 月台 yuètái 'platform' -- as in Taiwan and Hong Kong, 月台 yuètái is preferred to Mainland 站台 zhàntái. 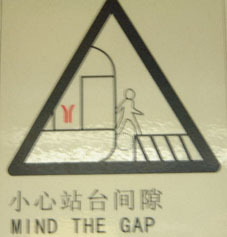 Guangzhou is the first city in China where I have found an equivalent to 'Mind the Gap'. Announcements for the next station on the Guangzhou metro are given in Cantonese, Mandarin, and English. Any further announcements -- information on changing trains, etc. -- are given in Mandarin only. The announcement to 'mind the gap' is broadcast over the PA system at just a couple of stations in the Guangzhou metro network, in particular Huangsha station, where it can be heard when coming from both directions. It goes as as follows, spoken in Mandarin. (This is the version as I remember it. Please let me know if you notice any inaccuracies). Xià chē shí, qǐng zhùyì lièchē yǔ zhàntái zhī jiān de kòngxì. 站台 zhàntái 'platform'. The Mainland uses 站台 zhàntái in preference to 月台 yuètái. This is slightly more explicit than the Hong Kong version, spelling out that passengers should take care when alighting from the train. Notice that this version does not use 请 qǐng 'please', unlike the Hong Kong version and the Singapore version (below). The request is thus somewhat less polite and more businesslike. Also, 'gap' is rendered by a different word: 间隙 jiānxì. Beijing's previously paltry subway network is finally starting to shape up into something worthy of a major capital. The newer lines display an increasing level of technical sophistication which is equal to or surpasses best overseas practice. One aspect of the upgrading of Chinese systems is the adoption of international styles of signage. Whereas the old subway system mainly sported warnings not to bring dangerous items (such as explosives, weapons, and hazardous chemicals) onto trains, the new carriages have signs on the doors that are indistinguishable from any modern overseas system -- well almost. 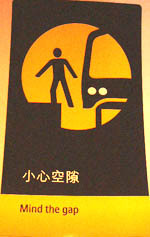 One of the new signs is our friend "Mind the Gap", or as it is rendered on the Beijing subway, "Mind the Gaps". The Chinese-language version of this is shown in the photo, taken on the No. 5 Subway Line which commenced service in September 2007. This is identical to the version found in the Guangzhou subway. It is fairly reasonable to expect that this will become the standard version in Mainland China in future.